The Library Voice: An AMAZING Virtual Visit To The Art Studio At Capstone Publishing! An AMAZING Virtual Visit To The Art Studio At Capstone Publishing! This fall we added several amazing books to our library from Capstone Publishing. They are from three different series.... Spot-It, Dessert Designer, and Green Projects for Resourceful Kids. The kids and I just LOVE the new books. I have heard from parents who have told me how much they are enjoying them at home with their children too. They are definitely a HUGE hit in our library! With all of this buzz taking place, I thought it would be very fun to bring the people behind creating these beautiful books into Van Meter School virtually.....and with a little help from my friends at Capstone Publishing who connected me to the three girls in their studio. Last week Karon Dubke, senior photographer, Sarah Schuette, author and photo stylist, and Marcy Morin, studio scheduler, Skyped with three of our classes at Van Meter. They first visited two of our Foods classes in the secondary. They invited our students into their studio and into the process of creating books like Smart Cookie and Piece of Cake! We loved seeing and hearing about the process of creating these books. They sent us a photo work sheet for a cupcake recipe to see what their "assignments" look like from the very beginning. The students couldn't believe that they baked and decorated the cupcakes in the same place that they set up and took the photographs for the cookbook. We also enjoyed seeing all of the different areas of the studio and what they used these spaces for. They can transform it into anything that they might need. I must admit....One of the best parts....their prop room! They have anything and everything for their books. Our young people asked Karon, Sarah, and Marcy all kinds of questions about their jobs and the books they have created together. We loved hearing them talk about how much they love what they do. I loved hearing Karon's story about being passionate about photography since she was young and how she had a teacher who believed in her. In the afternoon, our 4th graders Skyped with the girls. This is the group that has been creating an amazing I Spy book over the last several weeks in the classroom, art room, and library. They just Skyped with Jean Marzollo, author of the I Spy series, to get some great advice on revisions they might make, so this connection was perfect. Sarah is the author of the Spot-It series from Capstone Publishing. The kids were so excited to hear all about how they created the super fun pictures for the books and how she wrote the story for the books. They couldn't wait to pick up the books and see what they could spot too. Thank you to our friends at Capstone for bringing such a wonderful learning experience to our school community. And for bringing such beautiful books to our library for all of us to enjoy. You and the work that you do is inspiring. You are definitely making a difference. 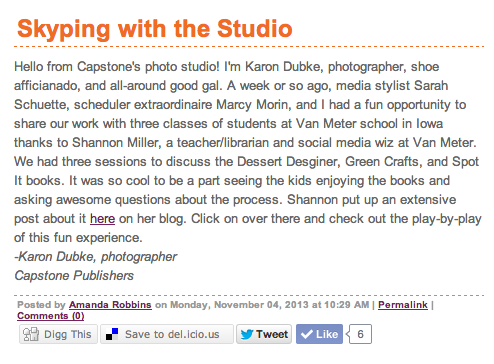 Karon also wrote about our fun on the Capstone Connect blog. Her post Skyping with the Studio can be found here. Thank you Karon for sharing too. Thank You Shannon, and the students at Van Meter! Their questions and enthusiasm were so wonderful to see and hear. I look forward to the next time and would love it if you could up for a visit. My teachers were the reason I became a photographer and that's why I get to do what I love everyday. Could you help me? I am very glad to find a story about Ms Karon Dubke. I'd like to know how to pronounce her surname. Is is like /Doob-key/? Or /Dub-key/ like Sub? Or anything else?